After Fatima we headed out to the coast for a last look at the Atlantic. We drove straight across to San Pedro de Muel then followed the coast north. Mile after mile of pine forest and sand dunes. There were a few beach resorts but they looked fairly new (well about 40 years old) and not a soul around. Now that could have been due to the pouring rain? As always we didn’t let it deter us and sampled a coffee in a 1960’s beach bar, then moved onto the carpark and cooked lunch in the van, to the amusement of the few workmen trying to shift the tons on sand blown onto the roads. Our campsite was at Coimbrao, just inland from the coast. Just for a change it wasn’t Dutch owned – this time it was German! A lovely big field site which was actually the owners back garden. In a little village that time seems to have forgotten but still manages to support 3 or 4 cafes and two small supermarkets. Yesterday we bit the bullet and made a proper move towards home. The sun was back out and it was fairly warm so we decided to head for the hills. From the coast we passed through Coimbra and drove past one of the oldest universities in Europe. From there the roads were very quiet as headed into the Serra Da Estrela – the highest mountain range in Portugal. A very different Portugal than we had seen so far, the houses looked almost Swiss to us and there seemed to be more locals around in the villages. We stopped for lunch in buffet bar – €5 for as much food as you could probably ever want. It was a bit of a “spot the tourists” job – everyone muffled up in coats and hats, in we come in shorts and t.shirts, these people need to get over to Wales and see what cold weather is – 15 degrees is not in any way chilly. We arrived last night in the tiny village of Nabainhos, and a lovely campsite called Quinta De Cegonas. In case anyone is wondering – yes its Dutch owned:) We are on a terrace overlooking the village and the valley. We went into the village Melo for a look around, half the houses are derelict and the other half fairly recently renovated. Lots and lots of what we call proper Portuguese ladies about (tiny women, all in black with woolly shawls and gappy smiles) and a real friendly feel with every person in the streets we saw speaking and saying hello. For the mountains it is much warmer than we anticipated but very windy too. Tomorrow morning we head for the border and over to Spain – time to search out a Mercadona and stock up the van with essentials such as olives, sardine paste and red wine to take home. 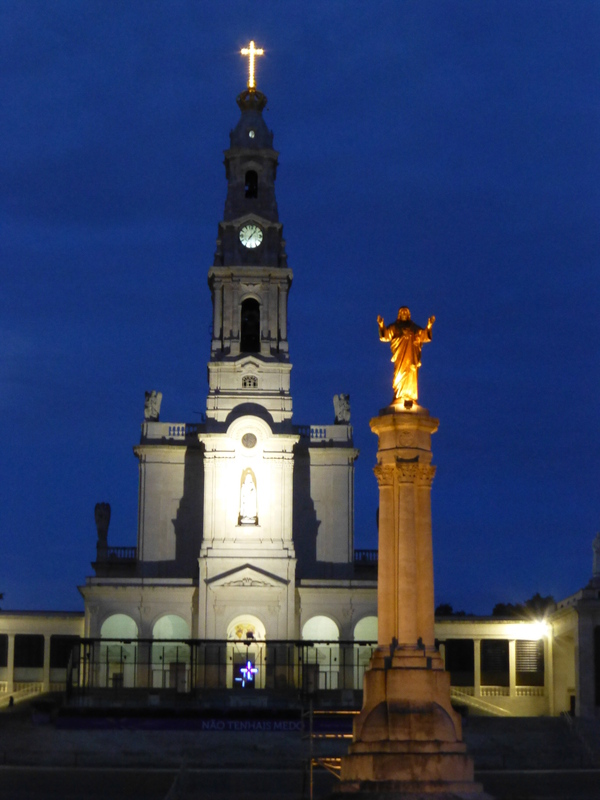 Another early away today – destination Fatima. Sav Nav doing its job well until we found a brand new motorway and she got a little confused as she thought we were driving over fields. Iain doing fine until suddenly motorway ends, Sat Nav is in melt down and road signs show everywhere but Fatima! A bit of quick finger in the air and a good guess and we are back on the right road, passing two Pilgrims walking to Rome on our way! We had heard there was a good aire in Fatima in one of the carparks – understatement of the decade. We have a bay twice the width and length of the van, water, drainage and a concrete picnic table/bench. Add to that we are 100 yards from the Basilica and have a wonderful view of the tower from our window and I am not sure we could pay for a better parking spot – and this is free! There are 20-30 other vans here with more arriving hourly, its a busy little carpark for sure. Fatima itself – so not what we expected. The plaza is the size of a couple of Wembley football stadiums with the Basilica at one end and Ingreja Santissima Trindade at the other. Despite the size the place has a calm and reflective mood, we lit candles for those no longer with us and sat in at one of the open air masses for a few prayers then just wandered around. We were surprised to see people crossing the plaza to the Basilica on their knees, we read it was an act of penance and is a daily occurrence as people arrive on bloodied knees at the edge of town. It wasn’t as busy as we expected though so no queuing to see anything. Underneath the plaza we found there were several more chapels and rows of confessionals, above each door showed the languages that priest could take confession in – at least 20 languages at a quick count. If inside was amazing, outside in town was weird to extremes. Hundreds and hundred of religious shops, literally. You could buy a keyring for €1 or a bronze Madonna for €2000, plates showing Jesus in flashing lights and everything in between. Shops that were just stalls, shops that were department stores – even the hotels and coffee shops were selling statues and crosses. Did we resist? haha no, we look like we are heading to a rosary convention, I couldn’t stop myself. Not sure I have ever been anywhere like this before. I think it is somewhere that needs to be seen to be understood, for sure it is inspiring. Whether you believe or not everywhere you go you see images of the 3 shepherd children who look so innocent and tales of the final vision which was witnessed by 70,000 – then you realise this wasn’t back in biblical days it was during WWI so fairly recent – it is a very thought provoking place. So the good of being right next to the Basilica is going to be tested as the bells are rung – loudly – every 15 minutes, could be a long – but tuneful – night. On the move again today, thick fog when we got up but by 10 o’clock it had lifted and sun was peeping about. We took a slow drive up in the general north west direction, avoiding motorways we used the back-roads through the villages. All very scenic and lovely – then we arrived in Abrantes. A bit of a shock to the system, nothing wrong with it but one of the first industrial type towns we have come across in 3 months. The river Tejo cuts the town in half, lots of recreational facilities along the river but the whole built up area didn’t appeal so we moved on and stopped for lunch on the Barragem do Castelo Do Bode. The road crosses over the dam so we had a cheeky lunch stop right on the dam with views down reservoir. 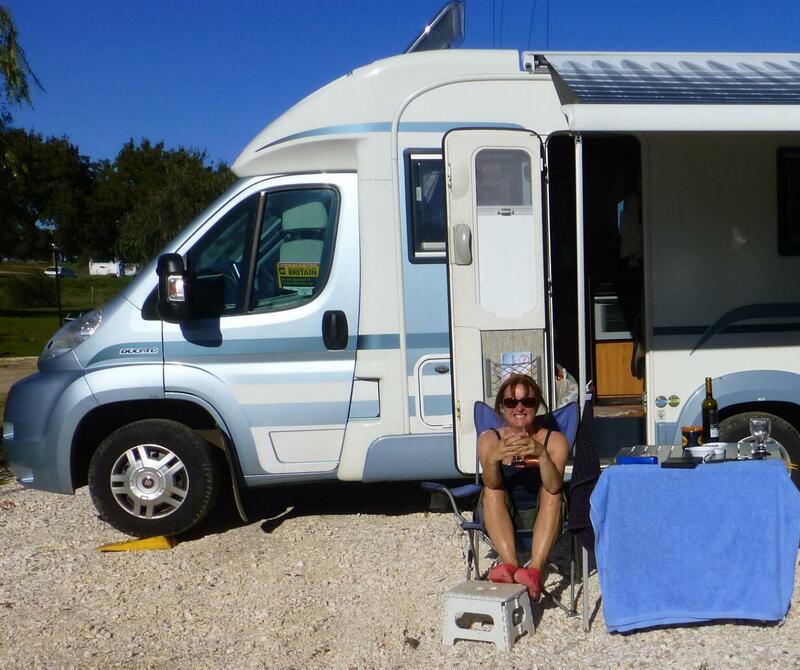 We decided on Tomar as a destination, and rolled up at a very lovely little campsite called Pelinos 77. The couple who run it are….yes Dutch. Its a lovely place, tiered pitches and a flat area at the bottom where we are parked up. The showers are open sided to the elements – luckily for us there isn’t any real wind around so its warm as toast. There is an incredible little bar at the top of the site, must get a photo, quaint as can be and looks like it should be in Holland. On the notice board are lots of great little sayings – and you get to take away “a smile”. Ok so we arrived and parked up, at which stage I mentioned to Iain we needed bread and supermarket was 5km backthe way we had come! Ooops. 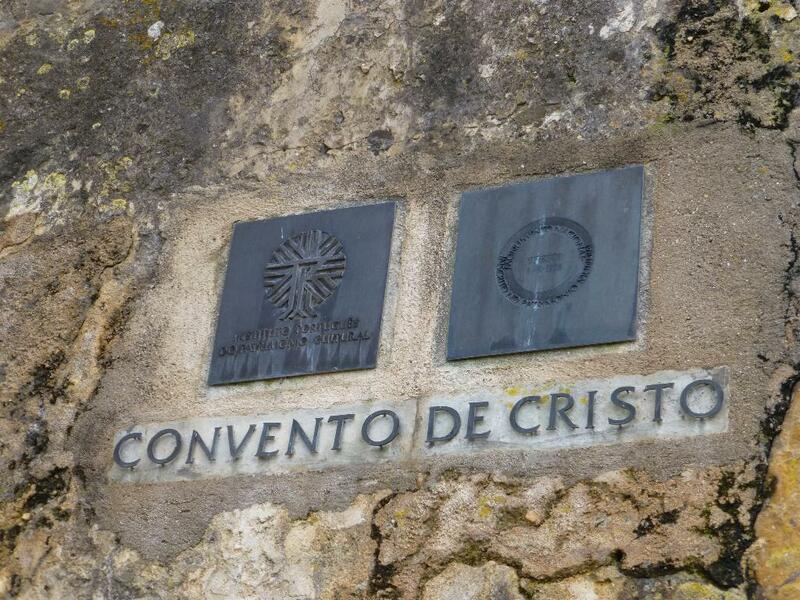 So off we went, at which stage it seemed stupid to me not to try and slip in a trip to the Convento De Cristo. We thought being Sunday it would be mad busy but worth a shot if we could find somewhere in the town to park. 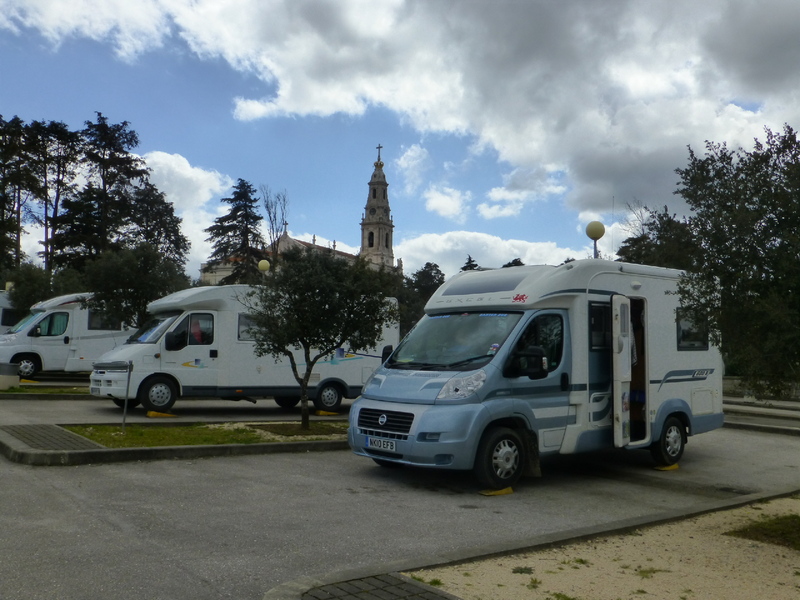 So we followed signs to the convent and amazingly found ourselves in a car-park at the entrance to the convent – just us and one other British camper-van, maybe all the other tourists thought it would be busy too. The grounds of the castle and convent were free, to go inside the convent was free until 2pm – after which it was €6 each, nope we didn’t understand what that was about but we paid up as too much of an opportunity to miss seeing this. The original convent was built in the 12th century for the Knights Templar. It is without doubt one of the most stunning and amazing places we have been lucky enough to visit. We expected a fair size convent, nothing prepared us for the huge building we were in. There were 8 different cloisters, all built over 500 years ago. The monks dormitories were on corridors so long we could hardly see one end to the other. Being Portugal (with a wonderful lack of health & safety overload) you were allowed to go pretty much anywhere; up on the roof (oh yes I was on another roof), down crumbly steps into basements and standing in cloisters where it did look that a few tons of gargoyles could come down on your head at any stage. We took a ton of photos, only a few below as its hard to capture the sheer scale and beauty of a building like this on a camera. We are now sat in the “Dutch bar” making use of the free wifi, drinking coffee and being totally impressed at the idea of having a bar in your garden – it has to be the way ahead. The roads were even quieter than normal, maybe the Saturday effect. After a slow drive we were here before lunchtime. Our site is lovely – and we are on another Dutch owned site. It’s a fairly large site, space for 30 campers but very spread out between cork and olive trees. they also have several small villas and a large quinta house to rent. There seems to be a lot of people around, many are on a walking holidayfor the next 10 days. Strange but since we have been in Portugal we have now stayed on 5 different sites owned by Dutch couples (and we have details of at least another 3 or 4 on our route). We have also stayed on a site owned by Norwegians and one owned by an English couple. We have never found any small sites owned by the Portuguese, only the massive sites around the coasts that are owned by big national companies. We are just back from a walk to the nearest town, Castelo De Vide. Took us 3 hours there and back, the walk was all on cobbled paths that have never seen a motorised vehicle and we only passed 2 houses all the way. In the middle of nowhere we came across the well in the photo – there was a small shed of an old house further up the hill so guess it would have been their water supply. Main reason for the walk was a bit of bird spotting – in just under an hour we saw 22 types of bird – and Cirl Bunting was a first spot for us. the weather forecast for today was bad, lots of rain – the good news was the forecast was wrong, we had rain for about 5 minutes other than that its been fairly warm and a little overcast. Having been told that Estremoz was a prolific producer of marble and the second largest exporter in the world we decided it was worth a visit today. Whilst waiting for the bus one of our Dutch camper neighbours appeared and kindly offered us a lift into the town, about 12km away. When we arrived in the enormous town square the first thing that hits you is indeed the amount of marble. It’s used everywhere, the doorsteps, pavements, kerbstones and even the actual the cobble stone pavements are made out of marble. On the edge of the town we walked to see the marble quarry – gigantic lumps of marble everywhere and the quarry itself 80 metres deep. The town itself is divided into three, at the top of the hill are the medieval walls and within them are oldest parts of town; a medieval castle, church, city hall and chapel. The old town is 425 metres high on the hill, on top of this you can climb the 27 metres to the top of the tower – oh yes, yet again I climbed and stood on the roof. There were incredible views for miles over the Alentejo countryside ( I didnt stay up there long but did take a few photos). The next part of the town is below the medieval part, a couple of hundred years old and has its own wall 17th century walls. Within this area are some beautiful churches and convents all around the edge of one of the biggest town squares we have ever visited. The newest part of the town is outside the walls. Pictures tell it better then I can….. 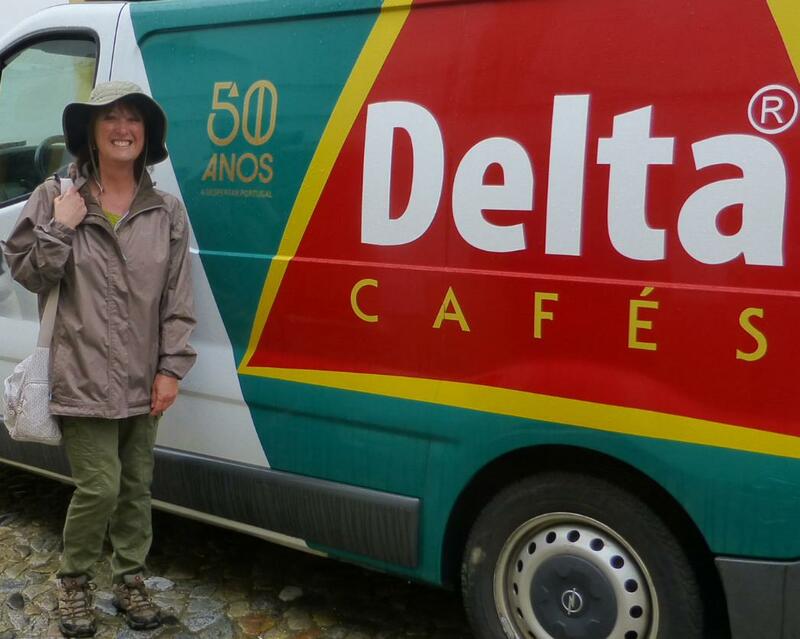 Both Delta Coffee and I are celebrating our big 50 maybe that’s where the addiction to Delta coffee has come from? We are now roughly 100 miles further North from Ourique. We are mid way between Evora and Estremoz at an absolute gem of a site, Camping Alenjento, run by a Dutch man (we have lists of campsite in Portugal all run by the Dutch for some reason). Anyway, its perfect – great showers, loo seats, electric and wifi. At €8 a night its a total bargain and a good base for the next few days. Well the 12th dawned wet and cloudy – who cares – its my big 50 birthday and we are going out for the day to celebrate. Destination Evora – mode of transport, the local bus. We checked times and bus leaves at 7.55am, so set alarms for 7am. For some bizarre reason alarms go off at 6am (ooops). Anyway, means we are ready early and catch bus no problems from outside campsite. After about 20 minutes bus arrives in town at a square, beautiful old church etc. So we are about to get off – but Iain thinks it may not actually be the town we are going to. Correct – that man – it wasn’t, our stop was another 10 miles away! After nearly an hour on the bus (its not more than 20 miles) we arrived in Evora, first stop the much talked about gypsy market. Massive, loads of stalls – nearly all of which sell knickers, socks or table clothes. There were a few selling secondhand shoes, one or two selling other bits and bobs but vast majority socks and knickers, so we gave that a miss. Evora itself, so worth the effort of going there. The old town has everything from a Roman temple, a palace, a cathedral and so much more. Cobbled streets, so tiny you could hardly drive up them (didn’t stop the locals using them for special stage practices). The main attraction was the roman temple which dates from the 2nd century, fairly amazing and even more so in that access isn’t in anyway restricted, no fences, no ropes just stroll right up to it. From there we went into the cathedral, another stunning place and for some strange reason our entry ticket allowed us on the roof! For the love of Jesus what the hell are they doing letting me on a roof?? There is no safety rail, its extremely high, it’s wet and very slippy – I was somewhat nervous (understatement) but hey I have a fear of heights so what better thing to do on your birthday? From there is was feet on the ground stuff, more churches than you could shake a stick at – we sat through half a mid morning mass in the The Igreja de São Francisco, the high light of which was an incredible solo sung by a lady from the congregation. Next door and my strange addiction to human bones was once more indulged with a visit to the Capela Dos Ossos – another chapel made from human skulls and bones. Every wall and ceiling covered in thousands. The motto over the door in latin translates to “we bones await your bones”! Lunch stop for today was pizza, not at all a local dish but very, very good. 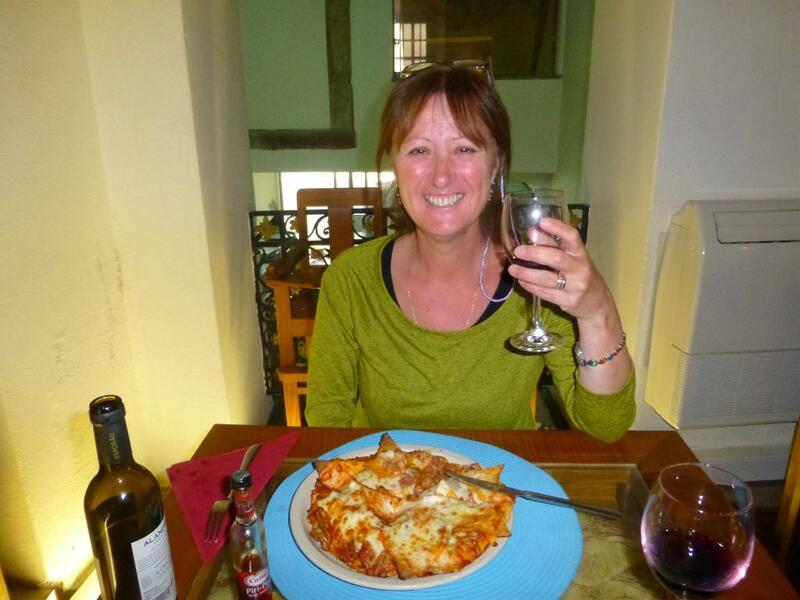 Chilli con carne pizza with nachos on top is the way ahead for pizza, made nicer by a half bottle of cheap vinho tinto. We had an amble around the shops after lunch, the sun came out, we found the bus terminal and then headed home. All in all a very lovely birthday day out, made even more special with lots of birthday text, emails and cards. My 50th banner is up in the van proclaiming my half a century (thanks Ros). We are settled in for the night, no bars nearby so will make do with some good cheap local red wine in the van.